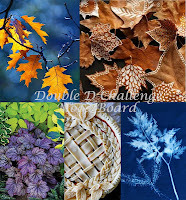 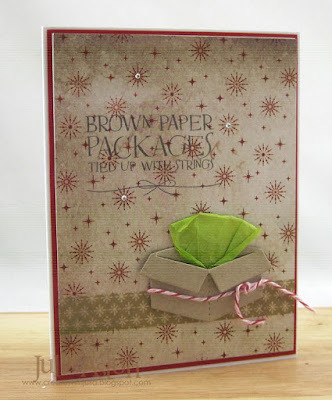 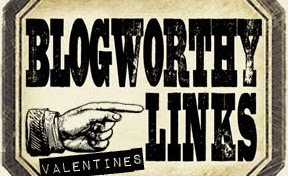 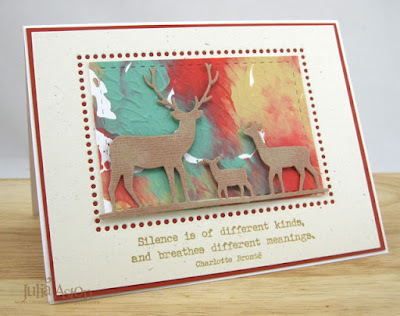 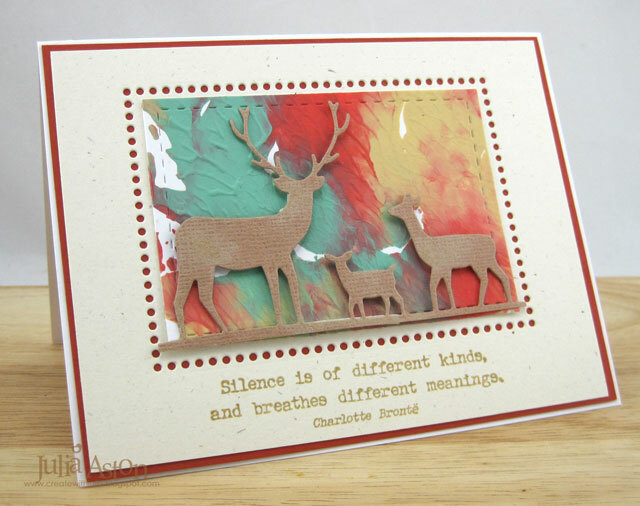 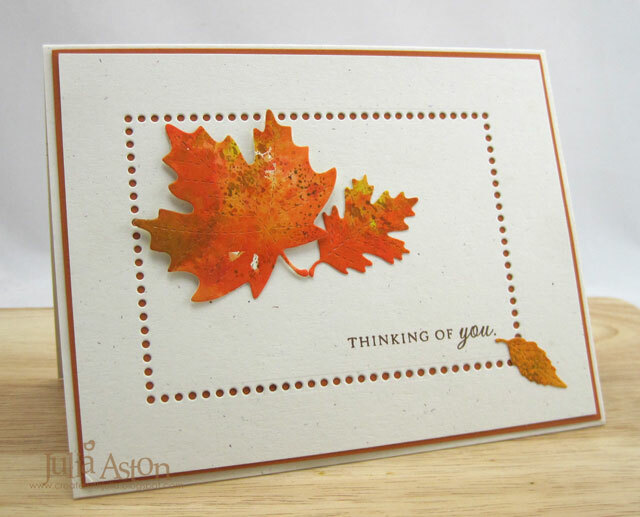 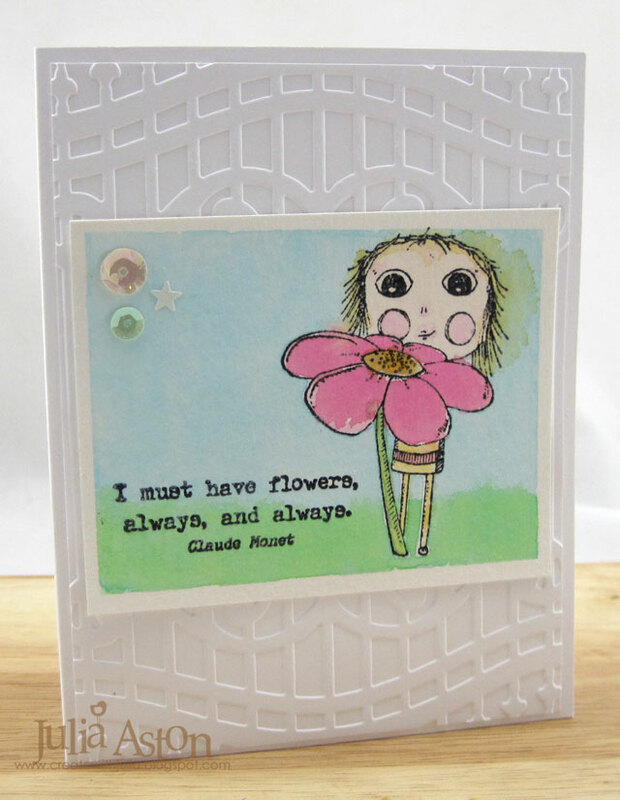 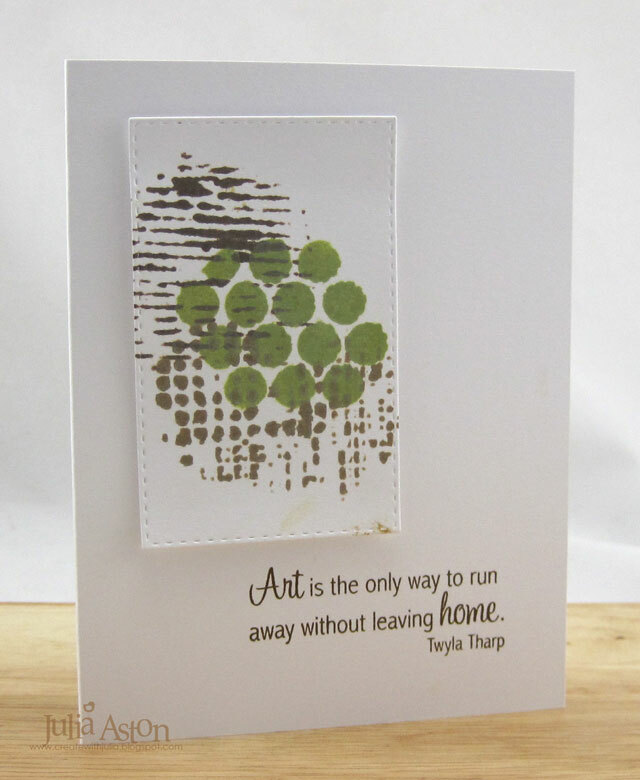 Today I played along with the Inspiration Challenge over at Splitcoaststampers - and once again, it reminded me of how great participating in challenges is - as it makes you get out things you haven't used! 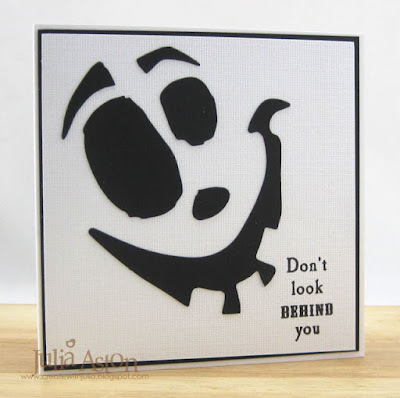 For the Inspiration Challenge Steph asked us to look at the cute web site JellyCat. I was inspired by Cordy Roy Fox and made this cute card! 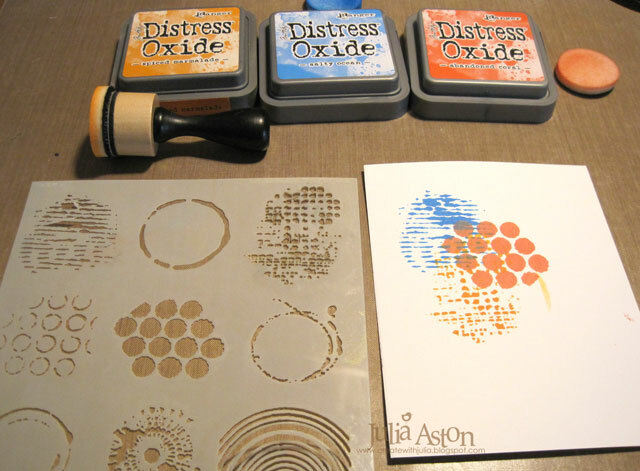 Note: if you buy the die - be sure to watch the video there to show you how to die cut it and how to put it together. 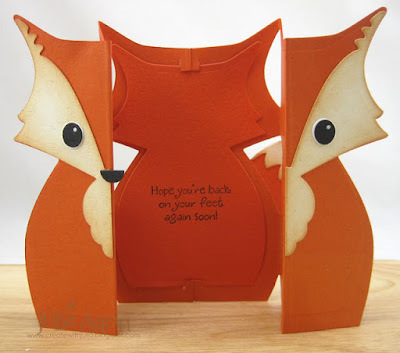 This is how it looks opened up - and you can use the smaller fox shape inserted inside (that my sentiment is stamped on) as a label by itself (hence the naming of the die "Label Fold Along Die") there's a separate die for that piece. 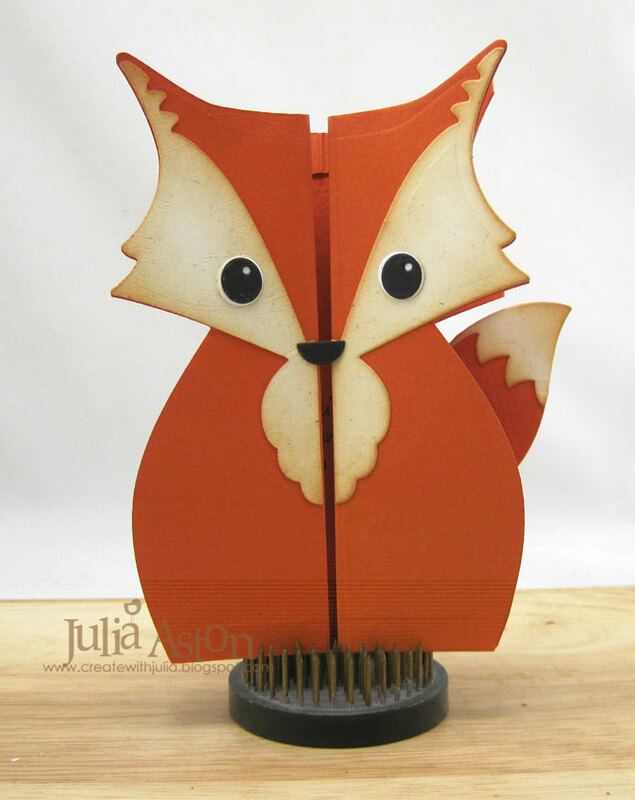 All I had to do was die cut the pieces - fold the front area (there's a little indent on the die marking where you do a score line - and add the eyes, mouth, fur and tail. 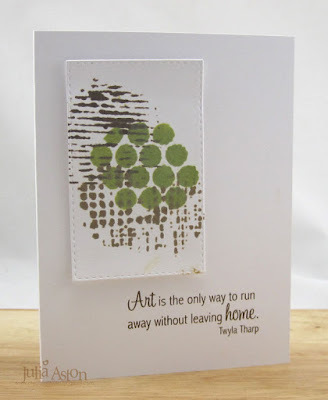 I sponged around the face pieces and tail tip with Ranger Distress Tea Die ink . 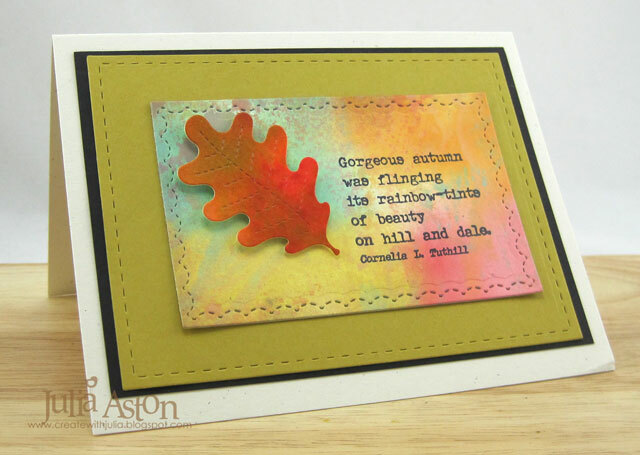 This is going to a friend who just had foot surgery - and I'm sure it will bring a smile to her face! 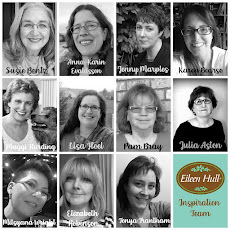 Eileen Hull's Sizzix Dies Fall-iday - Pucker Up! 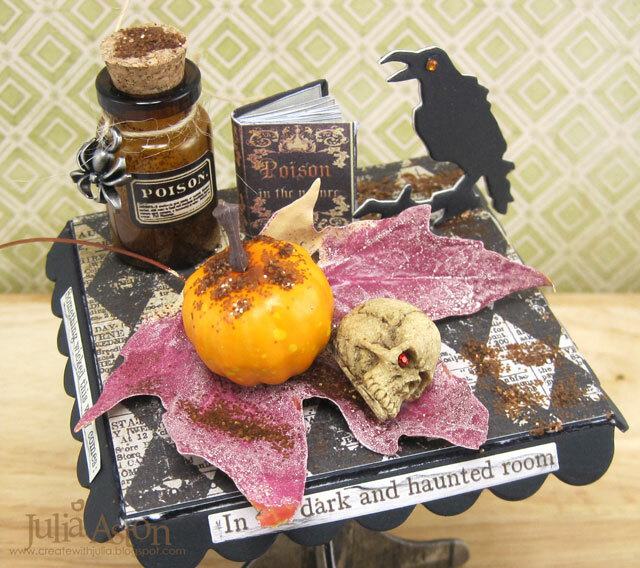 This month Eileen Hull's Inspiration Team is making projects for Fall-idays - creations using Eileen's Sizzix Dies with any holiday theme! 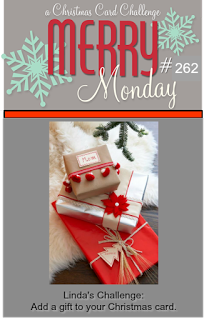 Today I've used Eileen's Embroidery Hoop Sizzix Die to make a Christmas Ornament! 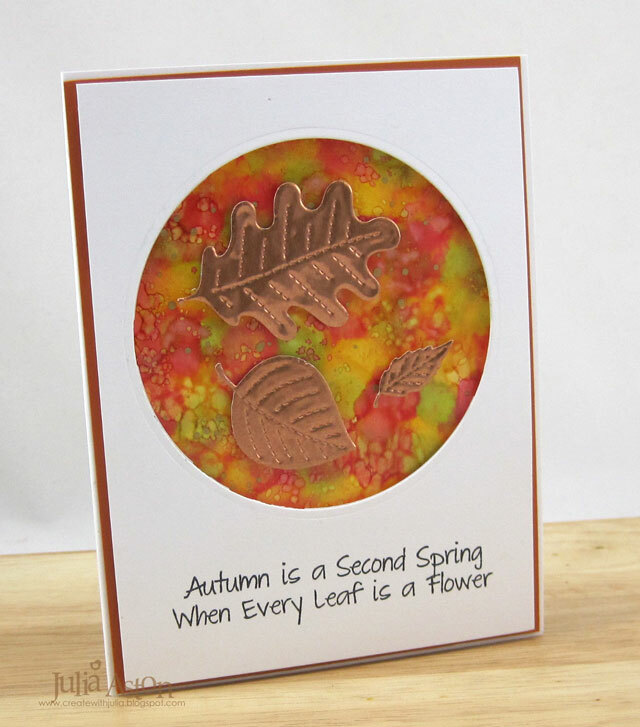 I made this using a tutorial over at Splitcoaststampers where they use a real wooden hoop and real burlap. I cut the hoop out of white mat board, then cut it again out of a piece of wood veneer that I used for the outside hoop. I cut a smaller circle out of burlap patterned paper and adhered that in the center of the hoop. 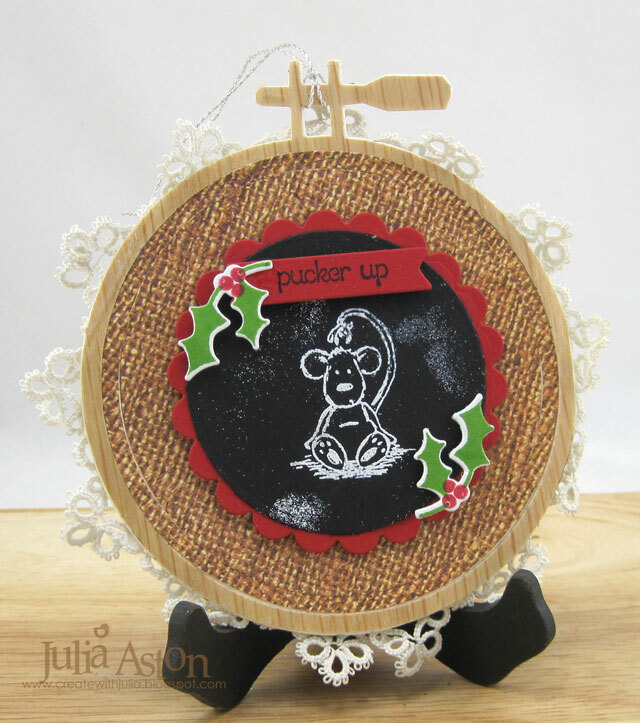 I cut a circle out of black card and white embossed the little mouse with the mistletoe on his tail onto it. 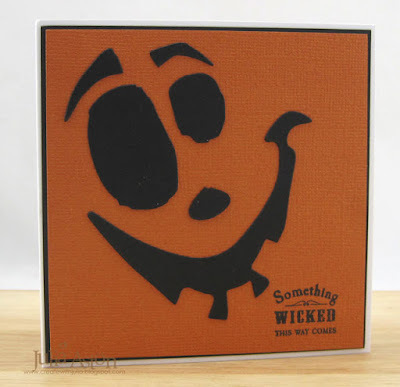 Since I wanted it to look like a blackboard I didn't use my embossing buddy before inking so some of the white stuck to other places looking like chalk smudges. I layered the black piece to a red scallop edge circle. 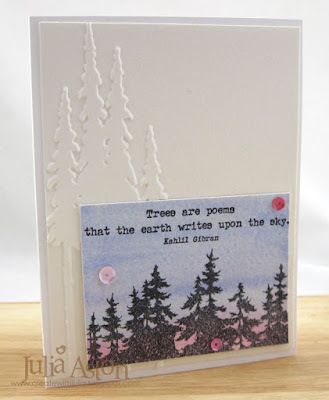 I die cut the label and stamped the sentiment on it. 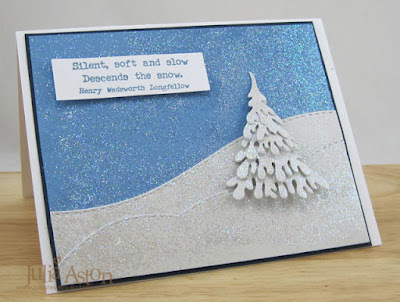 I die cut and stamped the holly. Everything is popped up on foam dots. 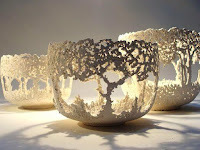 Then I adhered some vintage lace around the edge from the back and looped a piece of silver thread so I can hang it up. 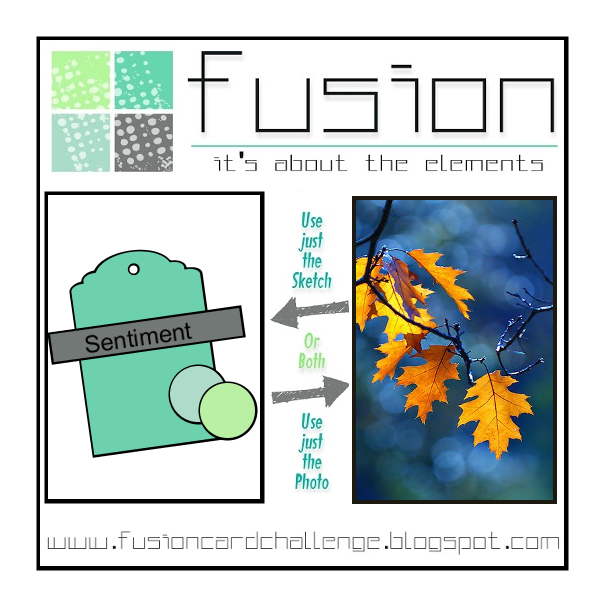 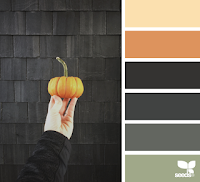 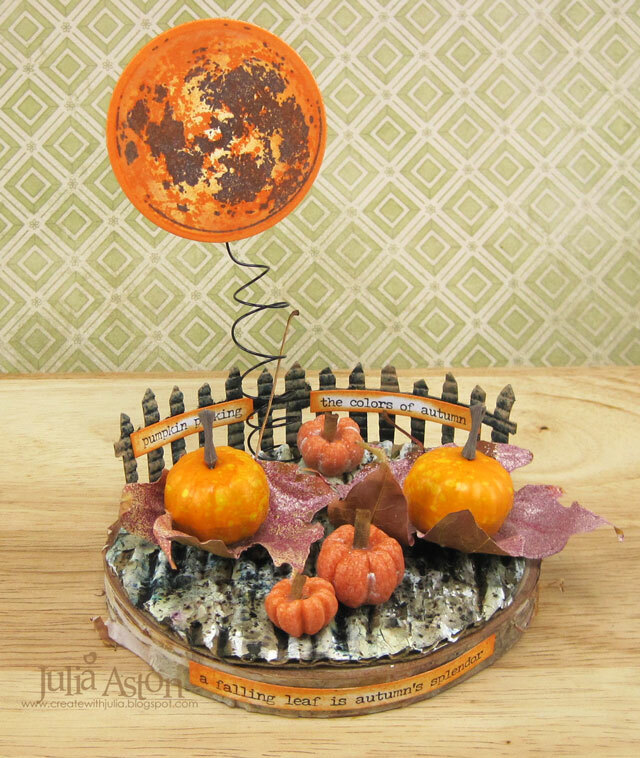 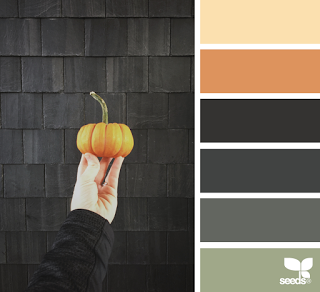 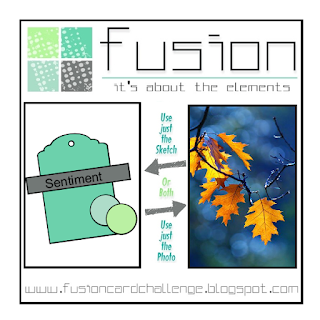 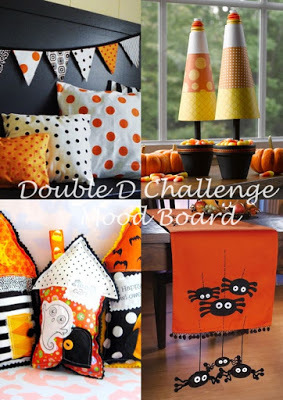 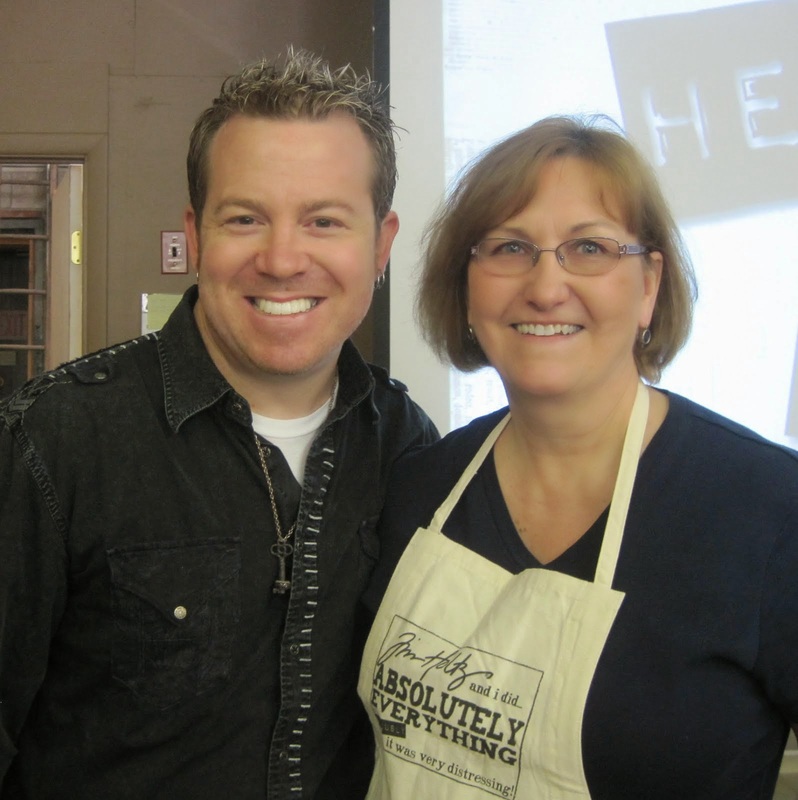 Please check out Eileen's blog all month for more Fall-iday inspiration! 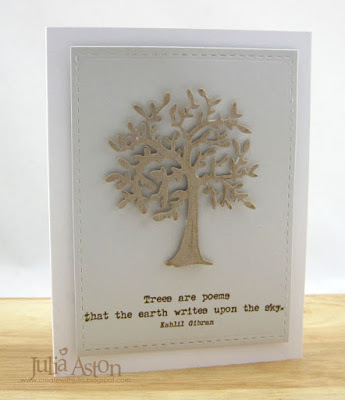 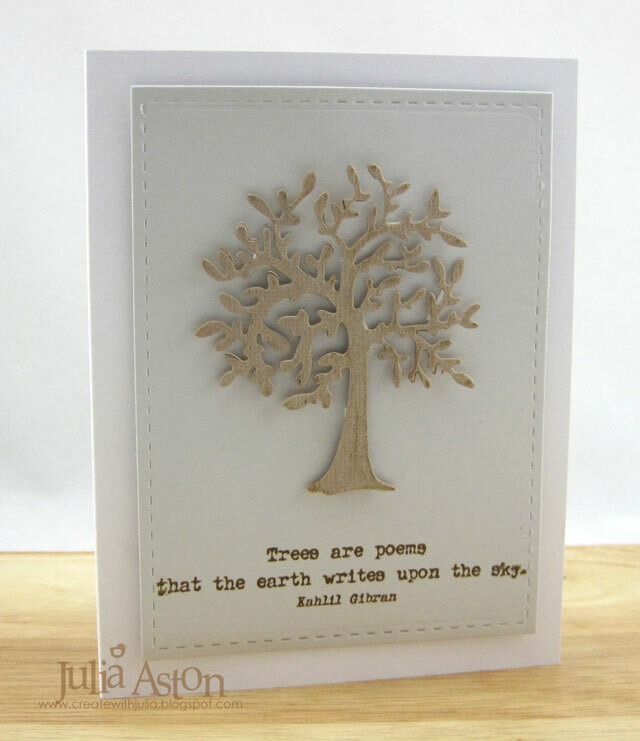 For my card, I used stamping, layering stencils and a stitched edge die. 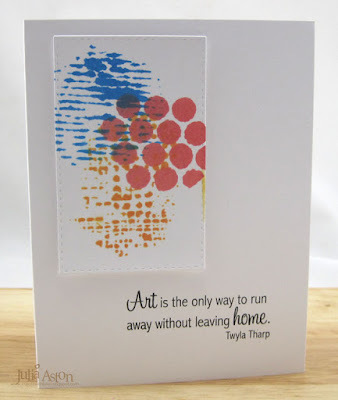 I die cut the stenciled panel with a stitched edged rectangle and then spritzed it lightly with water. The water makes the Oxides turn chalky and sort of seals them into the cardstock. I layered it to the card base with foam dots and stamped my sentiment. 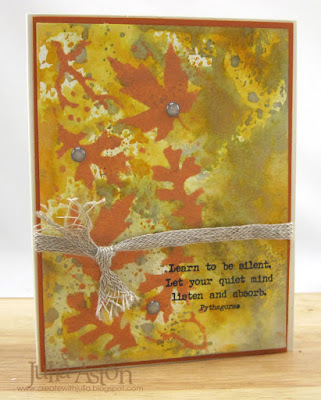 After I made my first card - I tried another using the same stencil but different color inks - this one looks more masculine using Distress Oxide Inks in Peeled Paint, Frayed Burlap and Walnut Stain. 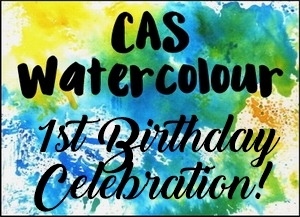 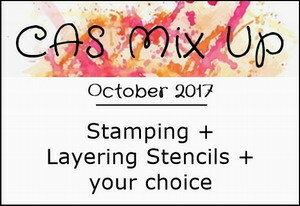 So please join us over at the CAS Mix Up Challenge and show us how you layer stencils on your CAS card! 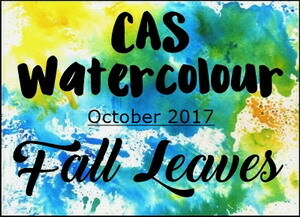 You have until Oct 24th! Accessories: Stencil - The Crafters Workshop (TCW), water mister, Stitched Edge Rectangle Die - WMS, foam dots. I used her Cup Cake Stand and turned it into a spooky apothecary table from a witches laboratory for Halloween! 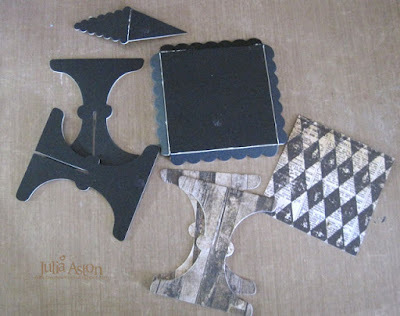 Here are the pieces of the Cup Cake Stand die that I cut out of Little Sizzles Black matboard (I didn't end up using the banner piece at the top there). I also cut out a square of DP for the table top and 4 pieces of DP to cover the legs, front and back. 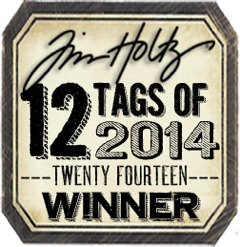 DP is from Tim Holtz Paper Stash Materialize. 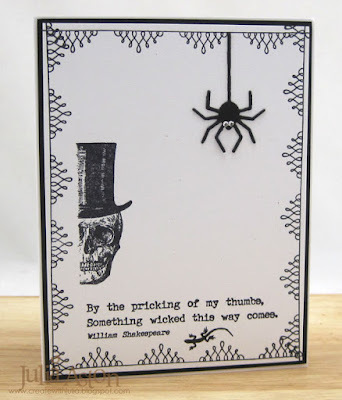 Several things from Idea-ology - Skull, Adornment spider, Clipping Stickers/Halloween, and Pumpkin Pieces. 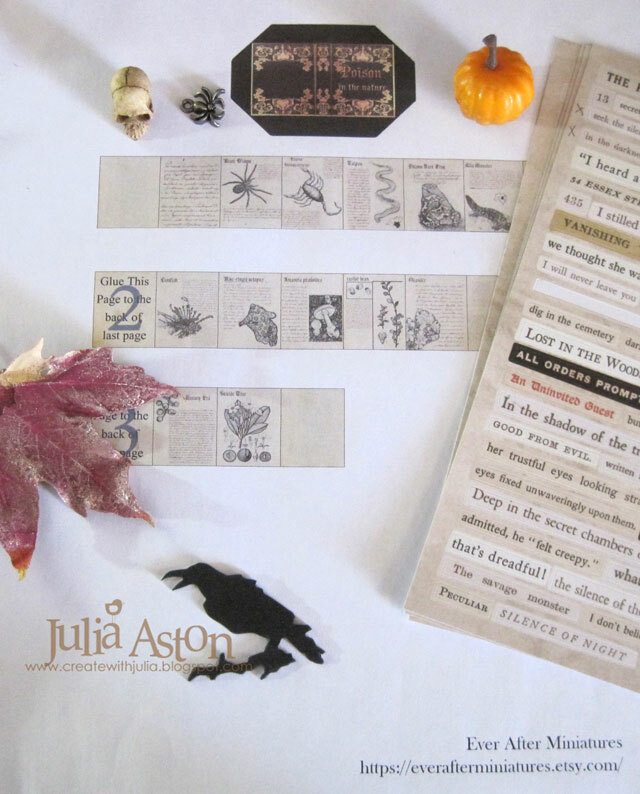 I also made a tiny Poisons in the Nature book using this sheet from Ever After Miniatures Etsy shop - you cut out the pieces, fold up the pages, glue, make the cover and adhere the pages in the cover. 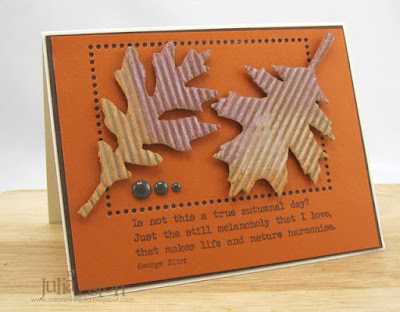 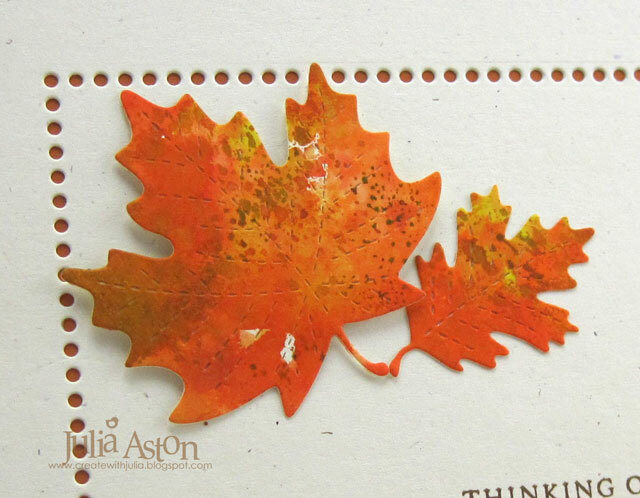 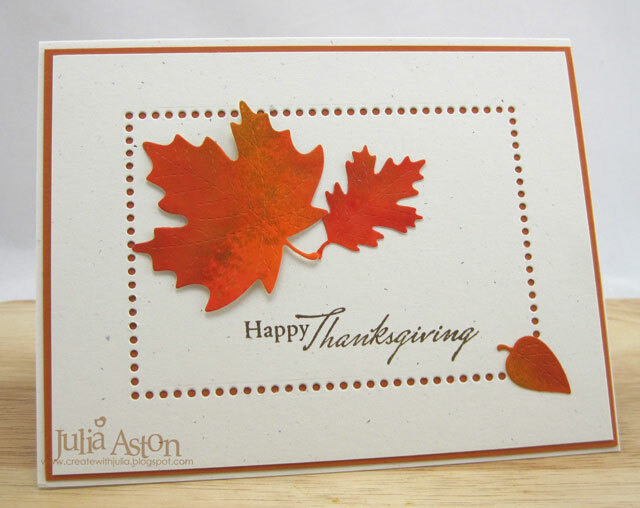 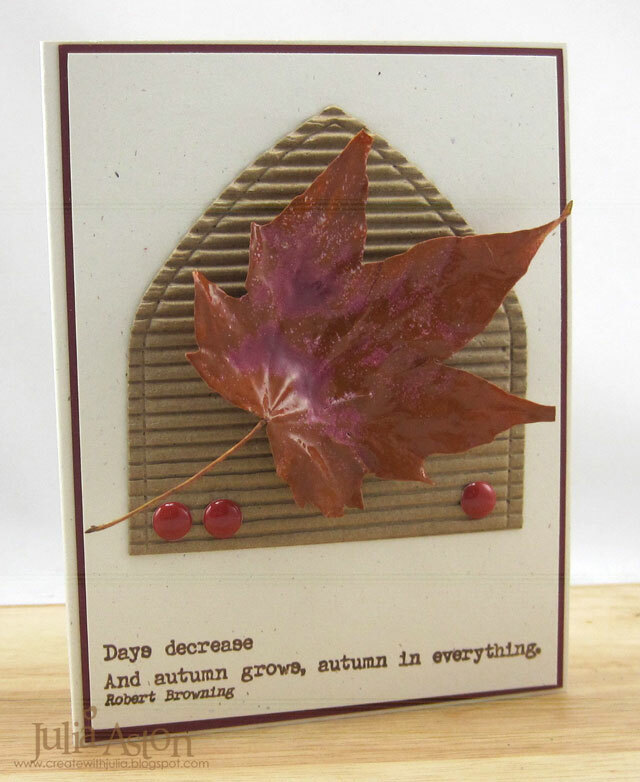 (you can see a tutorial of another book from another Etsy company that I made here) I embossed a real fall leaf I picked up when I was taking a walk using Versamark ink and 2 Adirondack Embossing Powders - Cranberry and Tan. I cut the raven using Tim's Movers and Shapers Mini Cat and Raven die. 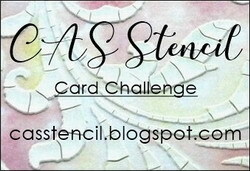 I used a black Sharpie to color the white that showed up on the creases of the matboard. 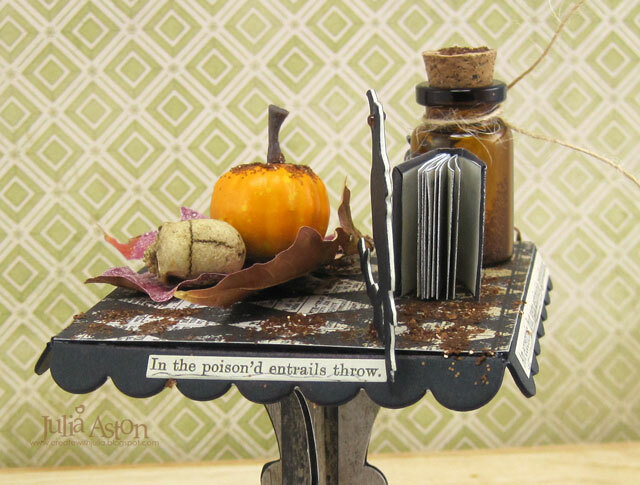 I added and Idea-ology Apothecary Vial to the table filling it a third of the way with Tarnished Brass Distress Glitter. 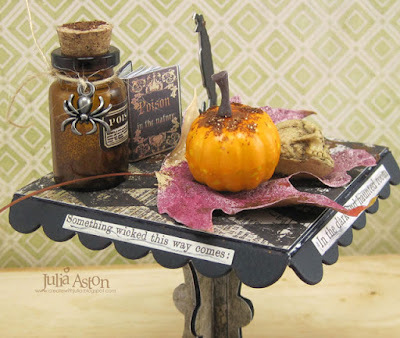 Then I adhered some of the glitter to the table, the leaf, the pumpkin and the cork on the bottle. 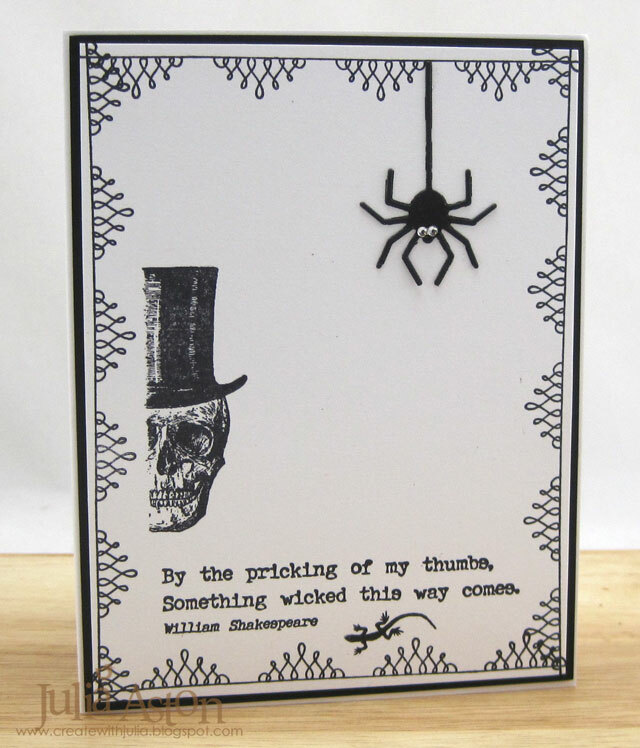 I tied a spider to a piece of twine and knotted it around the bottle. 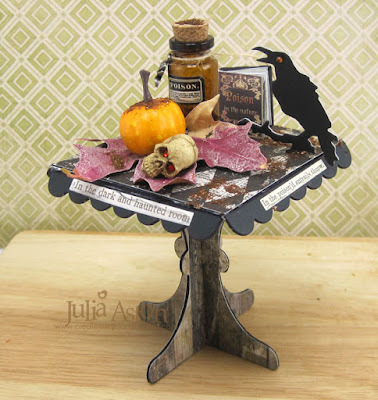 I added red Tiny Twinkles to the skulls eye sockets and orange ones for the ravens eyes (front and back). 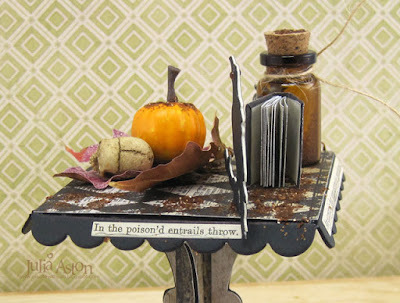 The Miniature Poison Book is just placed on the table so it can be taken off and looked through! 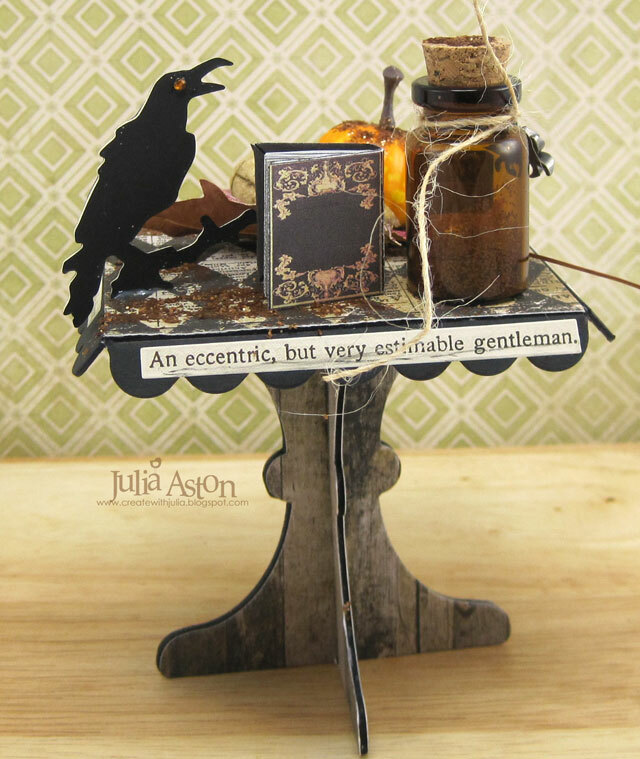 I put Clipping Stickers/Halloween on each side of the table edge. I love how this came out and think it will make a great Halloween decoration for table, window sill, desk or shelf! 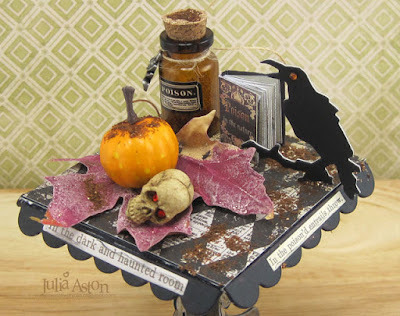 Accessories: Eileen Hull Cup Cake Stand and Pennant Die - Sizzix, Mini Cat and Raven Movers and Shapers Die - Tim Holtz/Alterations, Ideaology Skulls, Clipping Stickers/Halloween, Apothecary Vials, Adornments Halloween (Spider), Pumpkin Pieces, Miniature Poison in the Nature Book - Ever After Miniatures Etsy Shop, real leaf, Tan and Cranberry Embossing Powders - Adirondack, twine, Tiny Twinkles - Taylored Expressions, Tarnished Brass Distress Glitter - Ranger, black Sharpie marker, Black Stabilo Pencil.